I have recently succomb to the "I can't believe how big my baby is" mom freak out. It started when I realized that The Bean's hair was long enough to put in pigtails (it's always those little moments that make you realize) and really hit home the other day when I went through and boxed up all the baby toys and books. I will try and refrain from becoming a blubbering "what happened to my baby" mess and will instead focus on the positives. As I went through and boxed up all the baby stuff I held onto one of the larger board books that the girls have outgrown. I recently saw a chalkboard board book by Creative Kismet on Whipup, that I thought I would try and make for the girls. We already had some chalkboard paint left over from our magnetic/chalkboard project, so making the book was an inexpensive and easy project. As always I didn't actually read the directions until I was done, but Creative Kismet, begin by sanding and priming the pages. I did not do this step. I simply painted each page with the chalkboard paint using a foam brush. As a result, each page did take a few coats of paint and so the whole project did take a few days because I had to let the paint dry some between each coat. After I had painted all the pages I then put a strip of colorful duck tape along the binding of the book to prevent the paint from cracking and peeling there. After the book was all finished, I used a trick my sister told me about, and rubbed each page down with the side of a piece of chalk and then wiped it down with a cloth. This step makes it easier to erase later without leaving marks behind. 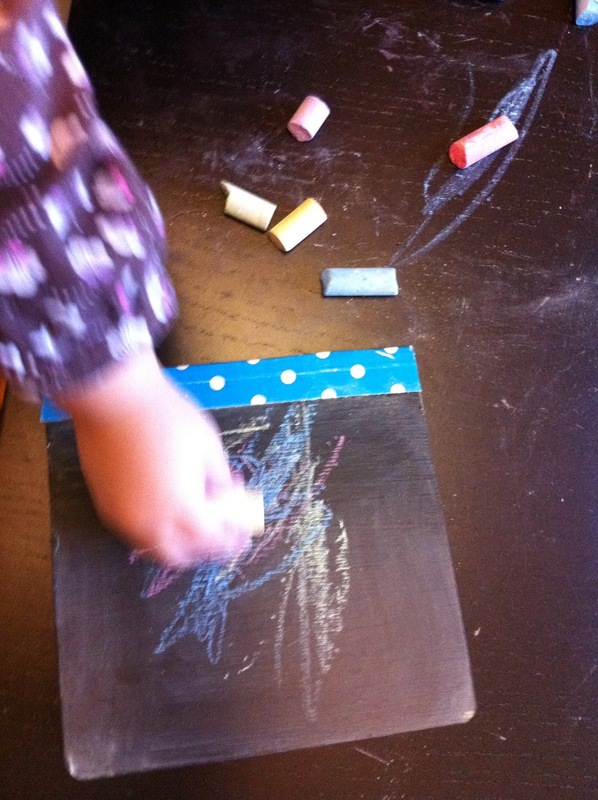 Then I got out the chalk and turned the book over to The Bean. Since she is so young I just left the pages empty but you could paint or draw some activities into the book for older kids. Both girls have been giving the new board book some attention and I am thinking it might be a good on the go activity! Oh I love it! This is going on my projects to do list for sure.